About two weeks ago, WorkaholicRunner asked me what my thoughts were on this pair of running shoes. In the interest of full disclosure, I have not owned many running shoes in the past 10 years. During that time the last 3 activity shoes I’ve bought before I started to go to the gym were hiking shoes from Nike, Salomon, Columbia and recently a bargain trail shoe from Skechers. 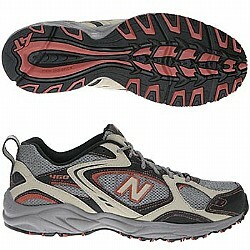 The last one was a wide-fit all black trail shoe which was more suited for mountain biking and spinning class. After several weeks of wearing that one it quickly became apparent it was not made for running on the treadmill as it frequently triggered my cramps near my flexor digitorum longus tendon. I figured I need to get back to the drawing board and find a “real” running shoe that has a flexible forefoot that would allow me to get a better feel of the pavement while providing sufficient cushioning on the heel. I must be getting old now cause I’ve found that I didn’t really like the new designs from Nike. I was curious about the ASICs and could probably be swayed to get ones from Adidas but found the old school design from New Balance more to my liking. After two weeks, I can say that I’m very pleased with this pair and got it for a fair price too at a discount retailer. I still have to experience the recurrence of my leg cramps on the treadmill which is usually triggered during the cold season. With the Skechers, they occured even during the peak of summer for some reason. I’m guessing this has to do with how the shoe absorbs impact when I pound on the pavement (I’m more than 200lbs). The New Balance MT 460 trail running shoe has just the right amount of foam thickness that I’ve been looking for and without the usually thick heels found on some hiking or cross-training shoes. Padding is sufficiently balanced from heel to midfoot to forefoot (no pun intended) . Comforable and lightweight, I felt right at home even from just the first day of using it. Beware of these shoes. Their pancake-like, unsupportive bottom and their lack of ‘tongue’ cushion are awful. I got a metatarsal stress fracture while running in them. I had to pitch them… such awful shoes, sorry to say.